My books are now available for the Amazon Kindle and Barnes & Noble Nook. Download Flying Lessons for the Kindle and the Nook. Download The Land of Misfit Bugs for the Kindle and the Nook. Flying Lessons is a book written for children grades 3 - 5, ages 9 - 12. Younger children love to have Robbie's story read to them. Adults find the story entertaining, enlightening and fun. The idea for the book came while I was sitting at a mall eating lunch. I noticed a bird had somehow gotten inside and was flying around the ceiling high over the heads of shoppers. Being afraid of heights myself, I realized I'd be very nervous if I were up that high, and silently wondered if there had ever been a bird that was afraid of heights. The story became not only a tale about a young bird who was afraid to fly. It also shows that it is only through facing and conquering what we fear most that we can have the life we're meant to live. The book highlights some of life's most important lessons. The Land of Misfit Bugs covers the topics of teasing and bullying, but in a fun way. Three little bugs, who are different in some way, band together in a search for acceptance and companionship. It is a story about being proud of who you are, having respect for others and appreciating the value of friendship. Written for ages 8 - 10. My stories are perfect for children's birthday and Christmas gifts. I hope you enjoy meeting Hoover, Robbie, Sarah, Jeremy, Webster and Sally. 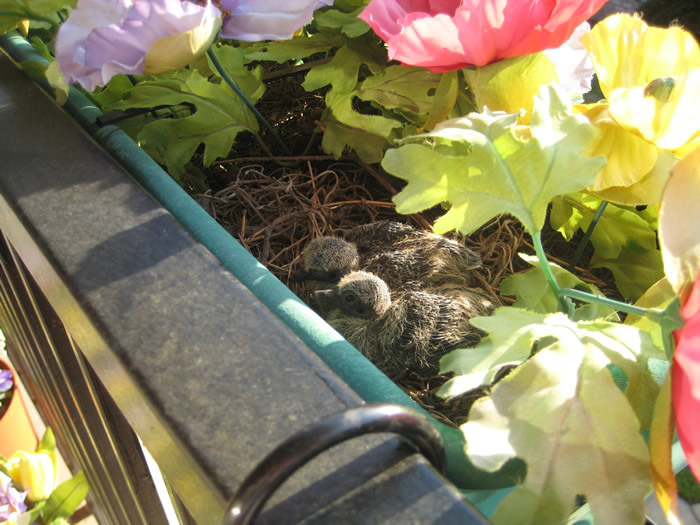 Photos of mourning dove babies! 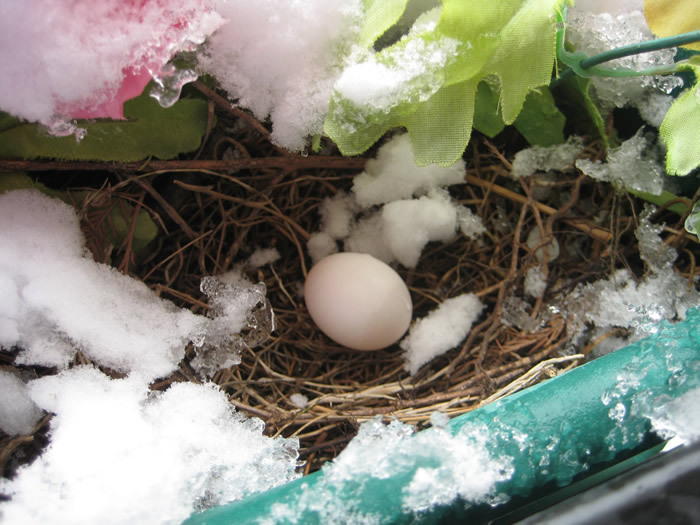 Mama dove laid her first egg the day of a bad snowstorm in Dallas. 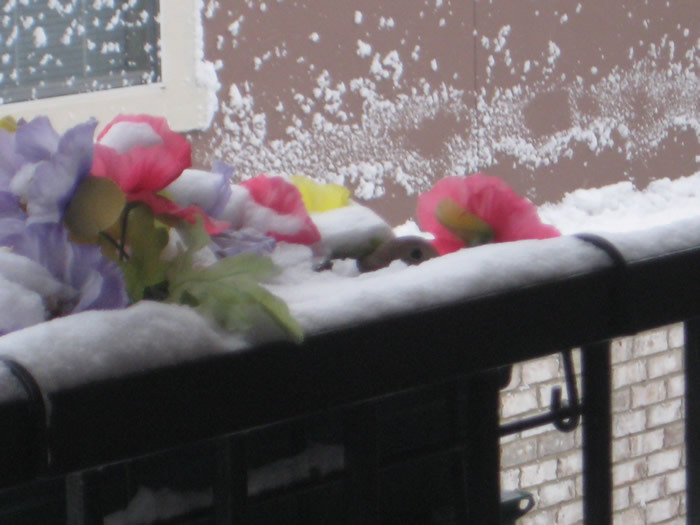 The first two photos show her head popping out from under the snow when I opened the door to see if she was still alive after the overnight wind and cold. The second photo is her lone egg in the nest. I didn't think the baby would survive, because Mom left it unattended for several hours. However, two weeks later, two babies hatched. 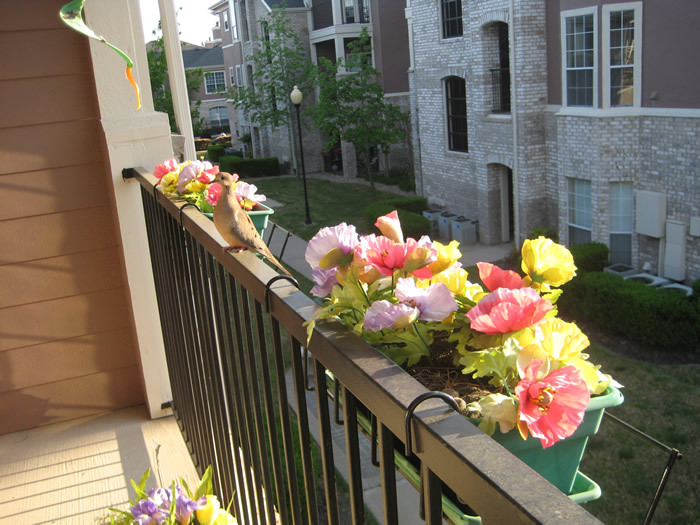 Mom let me get close enough on the balcony to get photos of her and her babies without flying away! 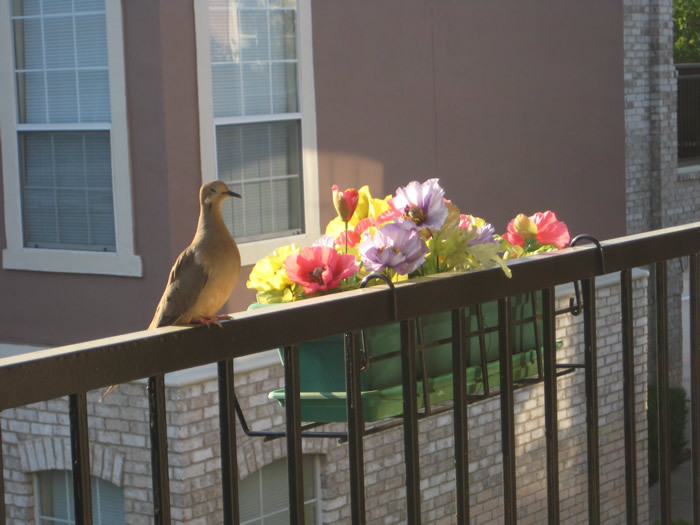 View past photos of the real mourning dove nest on my balcony!